In the world of cycling, your gear can be just as important as the bike itself. From your helmet to your clothes, if you are a serious biker, the right equipment can make the ride. Mountain biking can be a lot of fun, especially since you are traveling through different terrain and environments. Mountain biking presents some unique challenges, especially if you choose to ride at night. Unlike street biking, where you can have streetlamps to help illuminate the path, riding a mountain bike at night can be a dangerous proposition. That being said, if you have the proper mountain bike light, you can ride safely without too much-reduced visibility. Today I’ll be talking about the best mountain bike lights, and how to choose the right light for you. Below I’ve compiled some of the best mountain bike lights on the market today. Each model is moderately priced, with almost all of them costing a hundred bucks or less. Each unit is also highly rated, so you are sure to get your money’s worth. First, on our list is the Bright Eyes Rechargeable Headlight. Even though Bright Eyes is the company name, the lamp itself can easily be described in the same way. 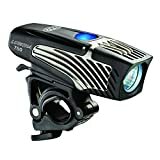 At the highest setting, this light will produce 1200 lumens, which is more than enough light for any good bike ride, regardless of the environment. This lamp has three settings: high, medium, and low, and the battery charge will last according to whichever setting is used. On high, the battery will last two and a half hours, on medium, it will last five hours, and finally, on the low light setting, the battery can last up to 20 hours. According to Bright Eyes, medium light is rated at 800 lumens, and low light is 350 lumens. Additional features of this light are an external battery pack, flexible strap to wear the light with a helmet, and a one-year limited warranty covering the battery itself. Finally, Bright Eyes offers a longtime guarantee on the lamp, so you know that it is quality construction. Next, on our list is the Cygolite Metro 500. 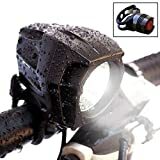 While this unit is not anywhere near as bright as the Bright Eyes, it does provide sufficient illumination for mountain bike and street riding. As the name mentions, this lamp is rated at 500 lumens, and has six different modes from which to choose. This light is durable, compact, and can easily recharge via USB. As far as lights go, this is one of the most simple setups, but it provides ample illumination when riding. Moving right along, here we have the Stark Bike Light LED set. This is the least expensive unit, costing only about $30 overall. Additionally, this light only provides up to 350 lumens, so if you need a bright headlight, the Stark will not exactly provide ample illumination. That being said, however, this unit is made with a heavy-duty aluminum casing and comes with a replacement guarantee, meaning that if you encounter any issues at all, the company will replace your device no questions asked. Also what I like about this light is that it is completely waterproof, which helps if you ride in the rain as I do. The last two lights on our list are made by NiteRider Lumina 750, which, in my experience, is a high-quality brand. Most of the company’s products are a bit pricier than other models, but what you’re paying for is a durable, long-lasting, bright light. 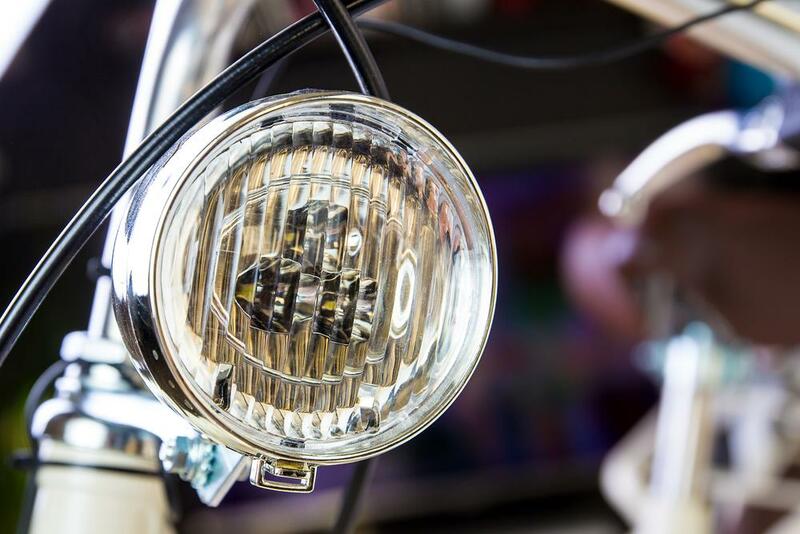 In this case, we have the Lumina 750 Headlight, which perfectly showcases NiteRider’s commitment to excellence. With up to 750 lumens, the Lumina is sure to provide ample visibility even in the dead of night. This unit also features five modes: high, medium, low, walk, and flash. The lumen ratings for the first four settings are as follows: High-750 lumens, Medium-350, Low-150, and Walking-40 lumens. The battery will also last according to whichever mode you’re on, for up to 18 hours of light at the lowest setting. Finally, the Lumina 750 comes with a durable, weatherproof housing so you can ride in the worst conditions without losing illumination. This light also has a rechargeable lithium-ion battery. Finally, we come to the NiteRider Lumina 700 Bike Light. When comparing this unit to the Lumina 750, there is really no difference between the two, besides the maximum output. As the name suggests the Lumina 700 provides up to 700 lumens on the highest setting. This light also comes with five adjustable modes: High, medium, low, walking, and flash. The lumen ratings for each set are the same as the Lumina 750 model, except, of course, the highest setting. The main reason I have included this model, however, is the price. The visible difference between 750 and 700 lumens is pretty slim, but cost-wise the 700 is over $50 less than the 750. That being said, since both models are built the same and have the same settings, you may want to opt for a cheaper version. Additionally, this model does have a helmet mount, so you can wear it on your head or attach it to the front of your bike. When looking at mountain bike lights, it may be tempting just to grab whatever’s handy. After all, a light is a light, right? Unfortunately, that is not the case. 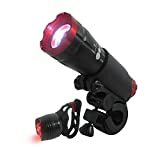 Even if you have a bicycle light for street riding, you will probably need something more powerful for best entry level mountain biking. As I said, there will be no extra illumination beyond the moon when riding in the wilderness, so make sure that whatever light you purchase is strong enough. A flashlight’s primary purpose is to illuminate the darkness, right? Thus, when choosing a bicycle light, you want to pick one that will provide ample luminance without being too bulky. When looking at flashlight brightness, they are classified by lumens. The more lumens the light has, the brighter it is. For best mountain bikes, you want around 300 lumens to light your path properly. Riding on rough terrain can be challenging in the best conditions, so you don’t want to be caught unaware by a stump or a rock because of low visibility. If you’re getting a headlamp as well, 150 or 200 lumens should suffice for that. Many mountain bike lights have controls to change between the different levels of light. If you’re riding in open terrain with the moon overhead, you can operate with lower light than if you’re deep in the woods somewhere. Some controls systems are more high-tech than others, so look at what features your light has before buying, as the more sophisticated systems will cost more. One other thing to check is if there is a strobe or off feature included in the different levels. The reason to check for this is that if you have to switch modes on the fly, you don’t want to suddenly have any light or be caught off guard with a strobe, especially if you’re moving at the time. That being said, there can be times where you would want a strobe, as in an emergency situation, so keep that in mind too. Depending on the size, brightness, and sophistication of the light, some mountain bike lights can be quite pricey. Most cost about a hundred dollars or less, but some high-end units can be several hundred bucks. Usually, the number of features, as well as the level of durability, will affect the price. When looking at mountain bike lights, it will be up to you if extra features are worth the added cost. The worst-case scenario of mountain biking at night is running out of flashlight battery in the middle of the woods. Especially if it’s Bigfoot season, not having a light can be a dangerous situation. Thus, check to see how long the batteries are rated to last in your light, and hopefully, you can bring spares. Additionally, having two lights; one for your helmet and one for the front mount can help alleviate problems since you have a backup already handy. The length of battery life will be determined by the kind of riding you do, but always prepare for the worst. Most lights these days have complicated lithium batteries which last a long time, but the new technology does increase the price. When choosing a mountain bike light, you may want to opt for a dual-beam unit, rather than a single. The reason for this is that you can direct each beam independently of the other, to provide much more visibility overall. That being said, dual-beams do take up more space, and if you have limited real estate on your handlebars, you may be forced to use only a single beam lamp. When choosing a mountain bike light, make sure that it is compatible with your bike before purchasing. Look at the mounting system hiking gear and the housing to ensure that it is durable and will not break off while riding. Ultimately, the terrain you ride on, the duration of your rides, and the time of day you ride will determine what features to look for in your light. Take into account all of the aspects of your routine before making a final purchase. When it comes to the best mountain bike light, I have had great experiences with NiteRider products. The amount of light provided and the battery life are more than sufficient for my needs, so I haven’t needed to expand beyond this company. 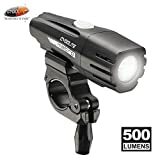 That being said, however, NiteRider is on the higher end of the price scale, so I would either recommend the Stark or the Cygolite lamps if you just want a simple, cheap mountain bike light. I love the fact that Stark has a replacement guarantee on their product, but I do wish that it provided more than just 350 lumens. However, if you ride on open terrain, this may not be that big of an issue.